Download the free program guide today and do your share for cleaner air! Yes, I am interested in having the Air Quality Partnership contact me about opportunities for my school/classroom! 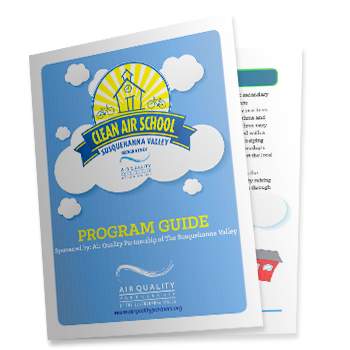 Clean Air Schools Guide Now! It’s Free! It’s Easy! It’s Good For Our Kids! The Air Quality Partnership of Lehigh Valley-Berks is proud to introduce a new program designed to provide recognition for schools that utilize the free educational resources and support services available through the partnership. Your participation can help protect young lungs from the health risks of air pollution, promote environmental stewardship in your students and help us continue to improve the air quality in our communities. Try a fun clean air project at your school! The following projects are intended to be educational, fun and easy to implement. Each project can be customized to fit your needs and you will receive free materials from your local Air Quality Partnership.